George Coates was a fine painter of portraits and figure compositions who studied in Melbourne at the National Gallery School and was awarded the school's travelling art scholarship. He left for Paris in 1897 with the painter David Davies (1864-1939). Coates was an official war artist in London in World War I and remained in England for much of his working life. He returned to Melbourne for a joint exhibition with his wife, the painter Dora Meeson (1869-1955), in 1921. The Australian War Memorial has an important collection of Coates’ work. 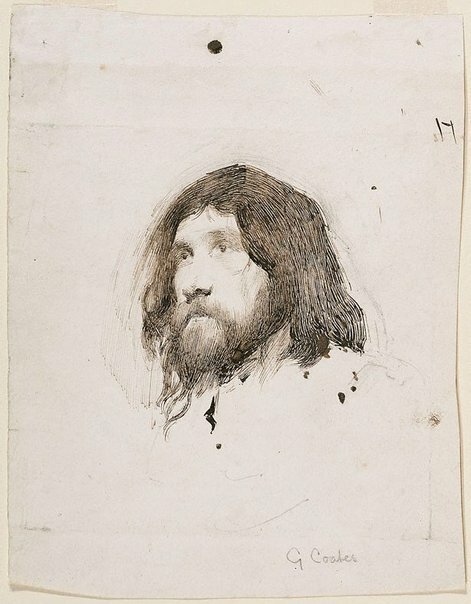 He exhibited with the Victorian Artists Society in Melbourne, where he met J B Kilgour, a member of the Victorian Art Society and Cannibal Club in the 1890s and father of the artist J Noel Kilgour (1900-87), both whom owned this drawing. The model is believed to have been a Russian musician in Melbourne in the 1890s. Lionel Lindsay also drew him, full length and in a cavalier's costume in Coate's studio in 1895. Signed l.r., pencil "G Coates". Not dated. Hendrik Kolenberg, Look , 'Australian images from the past: whether rarely seen or familiar, these works move and delight us', pg. 24-27, Sydney, Apr 2005, 27. Look , Sydney, Apr 2012, 41 (colour illus.). 19th century Australian watercolours, drawing and pastels from the Gallery's collection , Sydney, 2005, 85 (colour illus. ).